Fisherman's Processing is pleased to offer our customers great recipes - Enjoy! - Thanks to all our contributors. Ahi Poke - Nothing Better For Your Ahi! Looking for a great Ahi Poke? Look no further. Try our own Poke recipe - a true classic! Combine all ingredients (Maui sweet onion, Green onion and sesame seeds to taste) and mix with your freshly cubed Ahi! 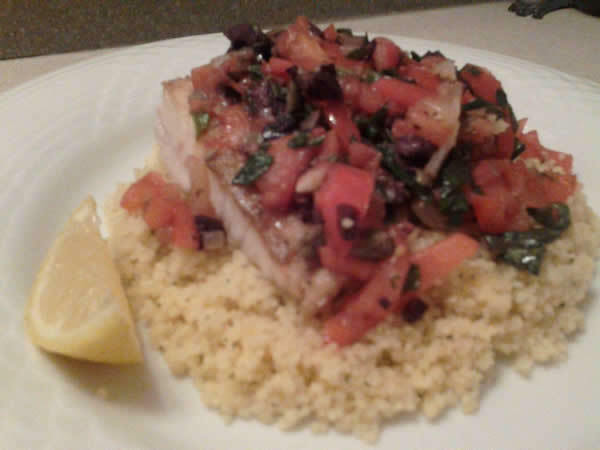 (4) - 6 to 7 ounces of firm white flesh fish, dorado, ono, yellowtail, sheep's, or halibut works great too ! Heat half of the olive oil in frying pan, salt and pepper fish well and dredge in flour and fry for 4 minutes a side then place on paper towels. Next place the rest of the olive oil in pan and add the shallots and chili flakes and sauté for about 1-1/2 to 2 minutes (carful not to burn) and then add the olives, tomatoes, basil, capers, wine and clam juice and simmer for about 3 to 4 minutes or until reduced. Season veggie sauce with salt and pepper to taste and place over fish, also this goes great over a bed of couscous (Near east in the rice section work well). This is a great recipe. 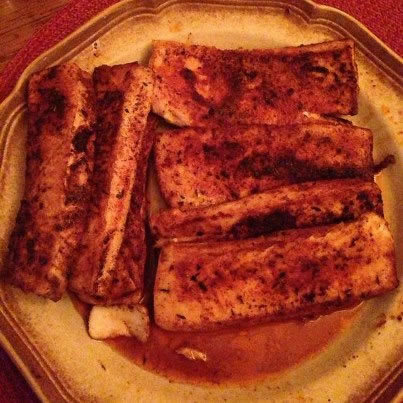 Thanks to Jan Howard for forwarding on Jason's recipe for Blackened Wahoo - a favorite! Sprinkle seasoning on both sides of wahoo filets. Heat skillet and put butter in skillet. Cook wahoo for about one minute per side in a very hot skillet. Serve with Cilantro Mango Sauce, white rice and sautéed vegetables (zucchini, red bell pepper, and mushrooms). Put all ingredients in the food processor and blend well. This sauce is great on fish, especially blackened fish like wahoo and yellowtail. Smoked Tuna Spread Courtesy of Lucy Mercer, "A Cook and Her Books"
adapted from Diane Rossen Worthington's "Taste of Summer"
In a food processor with the metal blade running, mince the shallot. Add remaining ingredients and puree until incorporated. Taste for seasoning. Serve with crackers or sliced baguettes. It's such a funny notion that a food could be something "to die for." Food should be something you live for, or so I try to say. Like this smoked tuna spread. Each fall, my husband will go on a long-range fishing trip that runs out of San Diego. When he sends the fish to the processor, he usually asks for a small amount to be smoked, which is why I occasionally have smoked tuna in my freezer. Because it's salty and smoky, the tuna is handy substitute for bacon ~ I like to stir a bit of smoked fish in with scrambled eggs; it's wonderful also in my baked potato soup. Try it on your morning bagel (whole wheat, toasted). And then there's this fish spread, just shallot, mayo, cream cheese, lemon and smoked fish, so easy. I serve it as a dip with crackers, and sometimes as a canape on crackers or baguette slices, so my guests don't have to do all the work themselves. This fish spread is so good, folks like to say "it's to die for." Don't say that. Just eat it. I used smoked yellowfin tuna to make this easy and delicious spread. If you can find buttery and tender smoked albacore, use that. You can use smoked salmon, too. Special thanks to Lucy Mercer / A Cook and Her Books. Try this recipe and send us a photo! Hi folks, here is another great one that’s easy to make and works with all fish! 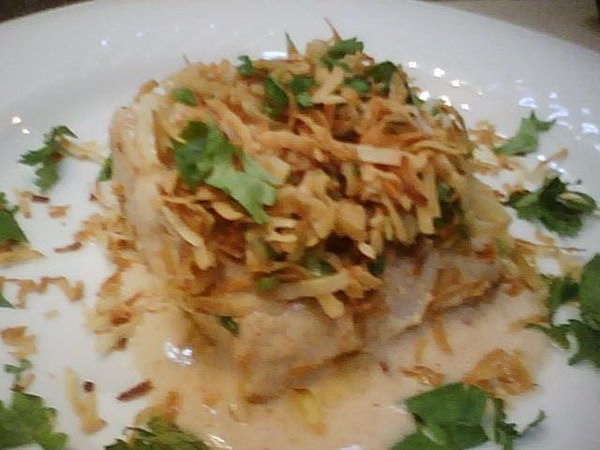 Place fish in marinade and coat well and put in the fridge while you toast the coconut and make the topping. Toast the coconut in a dry frying pan over heat turning over and mixing till a light brown (careful not to burn). Next, place 3/4 of the coconut in the bowl with the topping ingredients and mix well but retain 1/4 of coconut for the top. (check taste and if you like more salt just add a little more fish sauce). Next heat up oil in wok or a frying pan and take fish from marinade and shake off excess and fry for 3 to 4 minutes per side or until desired doneness and drain on paper towels. Retain marinade and heat in sauce pan and place on plated fish and then add the topping , coconut and garnish with it if desired and a slice of lime.